The Roman Numeral Bar Necklace in Sterling Silver is the perfect way to celebrate any special or meaningful day in your life. 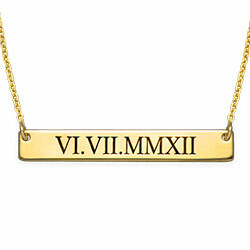 The Roman numerals add a classic spin to the trendy bar necklace style. Personalize the nameplate bar by engraving the Roman numerals that represent an important an anniversary, birthday, graduation or another significant event. The bar nameplate and the beautiful cable chain are both crafted from 925 silver, so this piece of jewelry will last as long as your memories do.